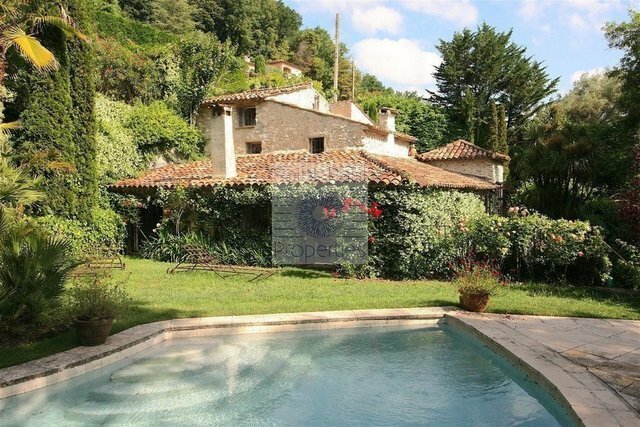 In a lush green setting this beautiful stone farmhouse dating from the eighteenth century, located in Saint-Paul de Vence, in a haven of peace will seduce you with its absolute calm, its authenticity, its typically Provencal charm. This lovely home consists of a main house, a guest house, and a caretaker's house. Sis on a raised ground of 2 529 m2 the main building consists of: On the ground floor: A large entrance overlooking a superb living room of 47 m2 attic opening onto a garden with pool, a fireplace and a dining room, a fitted kitchen opening onto a lovely terrace, ideal for breakfast sunny. A staircase gives access to the garden level which offers: a sublime master bedroom with a dressing room, separate toilet and a bathroom with double sink and shower overlooking the garden. On the first floor (separated in half-floors): a bedroom with a dressing room, a bathroom and toilet and a bedroom suite attic The property also offers a guest house consisting of: a spacious bedroom with large closets and a bathroom. Outside: this beautiful garden offers different spaces inviting to relax such as: summer dining room, outdoor lounge, a majestic fountain, a well, a summer kitchen equipped, and a very beautiful swimming pool out of sight. Features: exterior lighting, automatic gate, alarm, automatic watering, reversible air conditioning, four car parks, wine cellar, laundry.